Wahhabi justice or injustice is at it again. This time a Sri Lankan girl is about to be stoned to death for adultery, and an assembly of sadists are going to be entertained in public by this so called shariah punishment. Saudi Arabia, the birth place and exporter of Wahhabism is a member of the family of modern nation states and a member of the United Nations and its international affiliates. The United Nations must be ashamed to have among its members a country that in the 21st century is still steeped in medievalism practicing the most barbaric punitive judicial system. The five permanent members of the UN Security Council are unashamedly happy to court Saudi friendship knowing very well that that country’s medieval justice system goes against all accepted norms and values human progress and civilization. What is even more shocking is the silence of Sri Lankan Muslim religious leaders who seem to be approving this sordid punishment in the name of Islam. There are several among them who are progressive minded and who want to change that part of the fiqh or rules of religious governance that are not universally and eternally applicable but contextually constrained. But even they fear Saudi retribution if they openly advocate any objection. Petrodollars obviously have bought their silence. Wahhabism is the most intolerant of all the sects in Islam. Although it is a seventeenth century product its roots go back to ninth century. Today it has given birth to several other and even more extremist and intolerant offshoots such as Al-Qaeda, Boko Haram, and the ISIS. The despicable beheadings carried out by the ISIS criminal enterprise is no different from the beheadings carried out by the Saudi Regime. How can one condemn the one without condemning the other? Stoning to death, chopping of hands and foot and public whippings are other forms of medieval sadist punishments. The big powers are desperately coalescing now to wipe out the ISIS, but can they wipe out the ideology that produced and sustains it? Don’t the big powers realise that this ideology is spreading in their own countries with public knowledge? Why then is this hypocrisy? Without declaring war on Wahhabism Islamist extremism cannot be even contained let alone defeated. It is time the world Muslim community and its enlightened religious leaders speak with one voice and send a strong message to the Saudi rulers. There are areas of fiqh the needs to be reformed and modernised. Forms of judicial punishments is certainly one such area. It is no secret that even within the Saudi political hierarchy there are progressive elements that do not support these punishments and desire change. But they are a tiny minority, and even they because of the lack of popular legitimacy need the support of Wahhabi orthodoxy to hold their political positions. This is the tragedy of Saudi Arabia. Democracy and religious reforms need to go hand in hand. 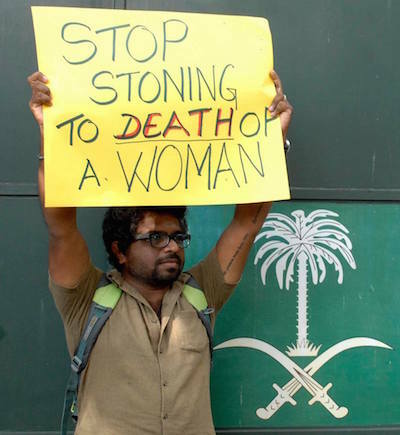 In the meantime, unless some miracle happens the chances of the Sri Lankan victim escaping the racist Saudi Arabian death sentence is very slim, because the person is a woman, Asian and non-Arabic speaking.